“We wish you Merry Christmas, we wish you Merry Christmas, we wish you Merry Christmas and Happy New Year.” The familiar melody reminds us that Christmas Day is coming on the fourth Friday this mouth. People make preparation for Christmas meals, Christmas trees,Christmas cards, Christmas gifts and others to welcome the the coming of Christmas season. Wait a minute, don’t forget about one of the most important things on 2015 Christmas－Christmas songs. There is nothing except for Christmas songs that can make your holiday more bright and merry. As the largest video-sharing website on the Internet, YouTube contains all kinds of video clips, TV clips, music videos and so on. Therefore, if you want to search for Christmas songs on the Internet, YouTube is a very good choice for you. However, it is a pity that YouTube only allows users to watch online videos, it doesn’t support to download videos from YouTube. Have no idea about how to download Christmas songs from YouTube? Don’t worry. Here I would like to share an easy way for you to free download Christmas songs from YouTube effortlessly. Installing the third-party software is regarded as the fastest and easiest way to help you download YouTube videos. A piece of professional and powerful online videos downloading software is high recommended here, named Leawo YouTube Downloader. It is more than a single online video downloader. It can be used to download Christmas songs from YouTube and other online video websites, like Facebook, Dailymotion, AOL, iFilm, Myspace, and Dailymotion, it can also download online flash videos at high speed. 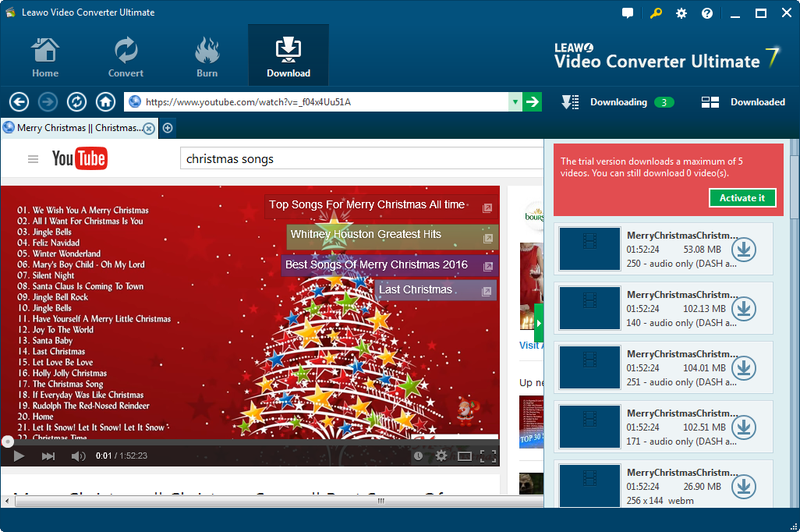 And the built-in video player supports users to watch Christmas songs online. Besides, during the Leawo 2015 Christmas Promotion, the company gives away 20000 codes for the software. You can visit the official webpage to enter your name and email, then you will receive a registration code for using YouTube Downloader freely. So if you really want to know how to download Christmas songs from YouTube or other online video websites, why not to free download it and have a try? And here are three simple steps to be followed showing how to download Christmas songs from YouTube. How to Download Christmas Songs from YouTube with YouTube Downloader? Step 1. Run Leawo YouTube Downloader and built-in browser will automatically jumps to the YouTube official web, then search and play Christmas songs you want to download. Step 2. Click the green arrow on the right side to open the download panel. Choose the resolution you want and click the download button. The video will be added to the queue. Step 3. The downloaded videos will be put to the “Downloaded” tab, where you can watch and manage them. This is how easy it works. 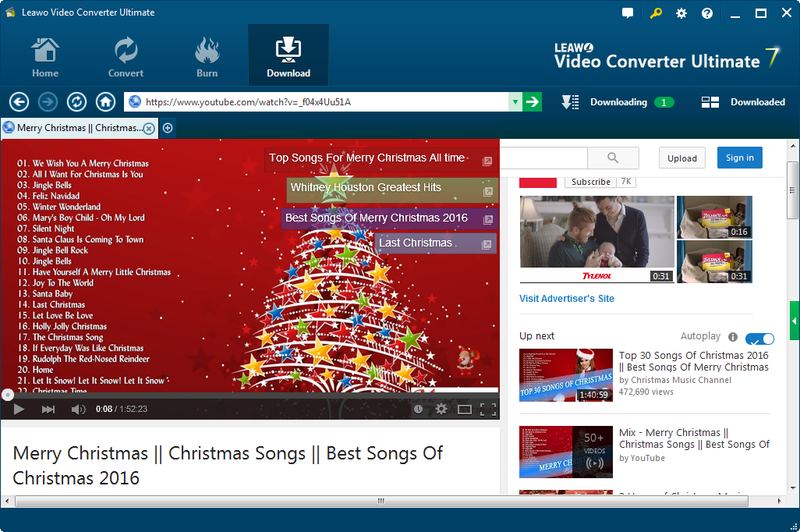 With the software, you can download a variety of Christmas songs from YouTube or other online video websites at ease. You can use your computer or other devices to play Christmas songs with no need for connecting the Internet after you install the YouTube Downloader software on computer. What is your favorite Christmas song? A classic, country or a popular one? Sad, black Christmas song or a happy one? Different Christmas songs have different enchantments. Every Christmas season brings a lot of artists releasing Christmas albums. Each one tries to leave their mark on history. The majority are remakes of Christmas song classics, but there are also brand new Christmas songs released each year. To get you in the Christmas mood, here are a few new Christmas songs that entertain and inspire. The above is about how to download Christmas songs from YouTube and 5 new Christmas songs recommended. The Christmas is coming. Are you ready to enjoy the Christmas season? If you still don’t know how to download Christmas songs from YouTube, don’t hesitate to use the software to save your favorite Christmas songs! And if you want to know how to record these songs from YouTube, Music Recorder can help you.